There's no getting away from it: I'm a man and I have needs. And sometimes Lisa just can't fulfill those needs. 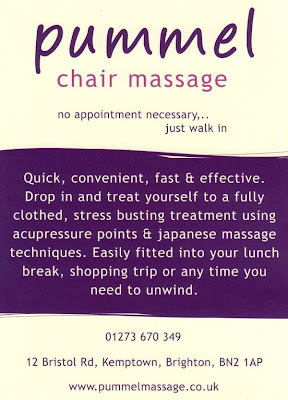 So I've spent the afternoon at a massage parlour. It used to be a hairdresser's called Scissorhands, which was obviously about as much use to me as a salad shop, but a few weeks ago Scissorhands moved to bigger premises around the corner, and were promptly replaced by a couple of people who'll beat you into the ground for eight quid. It's a definite improvement. Frankly I needed a massage. Having made arrangements to leave my front door open for six hours yesterday, the professional painters & decorators from CPS decided to sod off for the afternoon and never return. So my door still hasn't been painted. As if that wasn't enough, the hospital's HR department informed me on Thursday that they'd be sending me further details on my induction course, including (fairly crucially) what time it starts on Monday. Nothing materialised in yesterday's post, and as for today, well it's 6:30pm and I'm still waiting for the postman to arrive. Something tells me he's taken the day off. Either that or every flat in the entire block has coincidentally been sent no post on the same day. It's always possible. So by 4:15 this afternoon I was ready to hand over £17 to the woman on the right for a top-of-the-range half-hour pummelling designed to leave me "calm, refreshed and invigorated". And I have to say it worked. The chair you sit on makes you look a bit like you're riding a horse, and I was slightly concerned that anyone waiting would have to sit and look at my backside for thirty minutes, but my worries soon faded once Jayne got to work. It's hard to think about anything else when someone's kneading you to within an inch of your life. Anyhoo, it was very good. Not only did she do my back and shoulders, but she went on to my head, arms and hands, and even went down my legs. Frankly the only thing she didn't massage was my ego. Actually that's not strictly true. When I arrived, I'd mentioned by way of making conversation that I was due to start a new job on Monday. Jayne asked where, and naturally I told her. Well it turned out to be the best bit of small talk I've ever made, because at the end of the massage, Jayne told me that they give a discount to NHS workers, and promptly knocked two quid off the bill. The new job's paying off already.